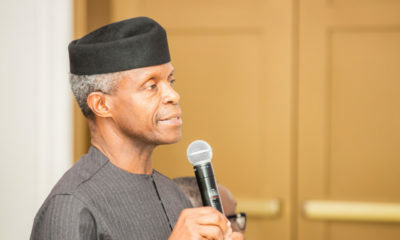 Laolu Akande, the Senior Special Assistant (Media and Publicity) to Vice President Yemi Osinbajo has announced that the latter, while acting as president, signed Joint Venture Financing Arrangements worth $1.78bn (about N640bn) on two occasions in July. Akande made this known in a series of tweets. There had been controversy after NNPC GMD Maikanti Baru‘s response to Minister of State for Petroleum Resources Ibe Kachikwu‘s memo to President Buhari where Baru said he got presidential approval. However, Kachikwu had said that Osinbajo, had at around the time referred Baru to the NNPC Board (which Kachikwu heads) after Baru approached him. Kachikwu said Osinbajo directed him to the board so that the necessary consultations be carried out. This created insinuations that Osinbajo may not have signed the financing arrangements, fuelling rumours that Buhari had signed them during sick leave. 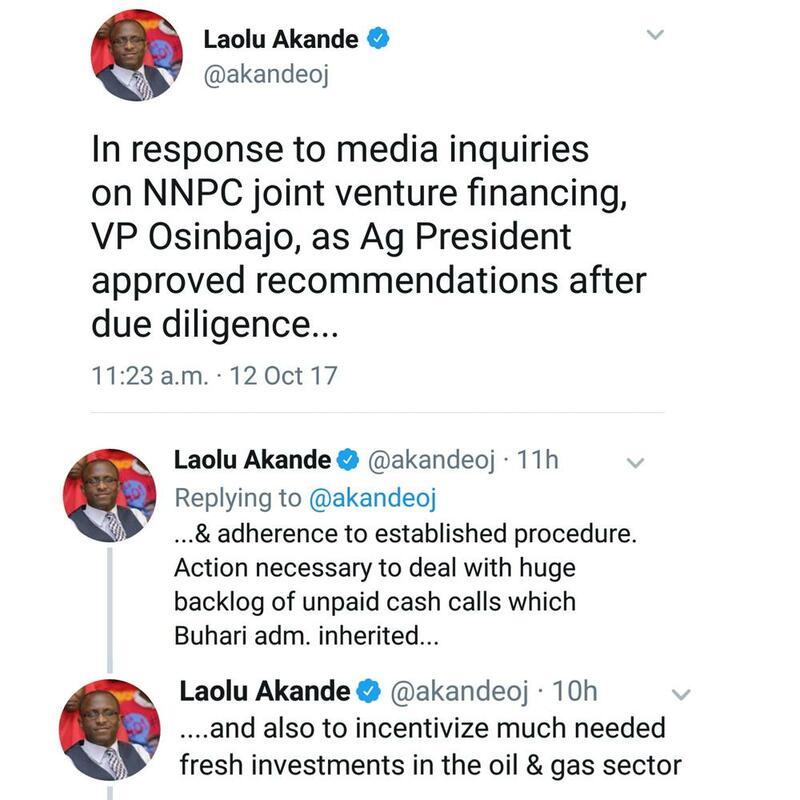 Our attention has been drawn to some misleading reports suggesting that the Vice President approved certain procurement contracts for the Nigerian National Petroleum Corporation (NNPC). This is totally false, as the approvals referred to were actually for financing arrangements in replacement of the traditional Joint Venture Cash Call obligations. In the statement of NNPC recently released in response to allegations made by the Minister of State for Petroleum Resources, reference was made to various financing arrangements with NNPC’s Joint Venture Partners, which were approved by the Presidency under the current administration. While the first was approved by the President in person, the second and third were approved by the Vice President as Acting President. The NNPC Act, Cap. N. 123, Laws of the Federation, (updated to 2010), authorises the Corporation to borrow such sums as it may require in the exercise of its functions. 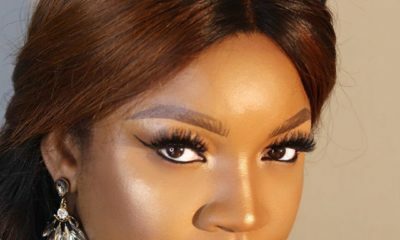 is to be in currency other than Naira; andis to be borrowed by the Corporation otherwise than temporarily, the Corporation shall not borrow the sumwithout the prior approval of the President. These financings are purely commercial loans obtained by NNPC and its Joint Venture partners, mainly from local and foreign banks, to perform their exploration and production activities. Repayments are also made out of revenues from the crude oil produced directly by the funded project. Unfortunately, they are being confused with contracts for goods and services. The alternative financing arrangements became necessary as inability of Government to meet its cash call obligations had stalled further investments in the petroleum sector and reduced the country’s production capacity. This post has been updated to include additional information from the VP’s Office. VP Osinbajo has become the fall guy in this NNPC contract saga. Now they are showing the man the dark side of politics. PMB , does corruption have another name when it hangs around the neck of your tribesmen? Bella, your headline is misleading. The VP signed JV financing for cash calls not contracts. BN, This article is quite misleading. 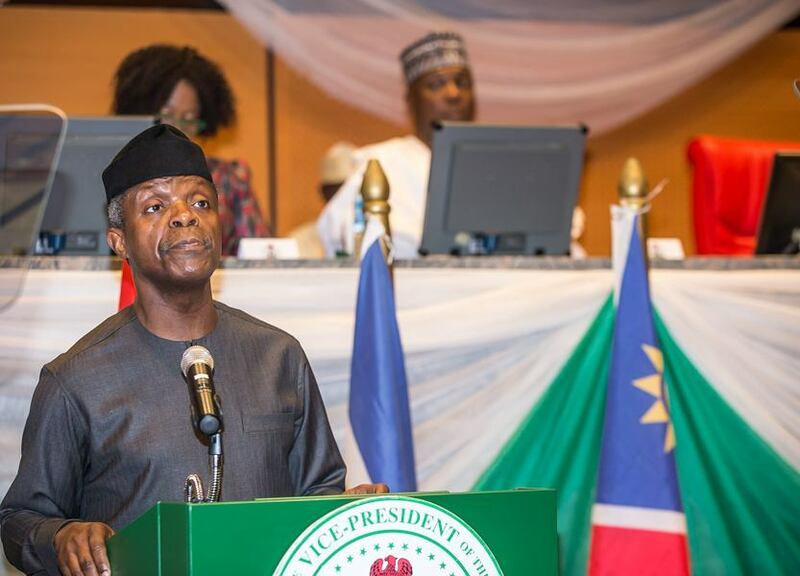 Osinbajo approved financing arrangements to clear a backlog of payments and not contracts for purchase orders, he said as much himself. It is obvious Baru thought he could play a fast one by saying he had approval procurement. BN, this headline and article are very misleading. The office of the Vice President has in a press release addressed this issue succinctly. the Corporation shall not borrow the sumwithout the prior approval of the President.